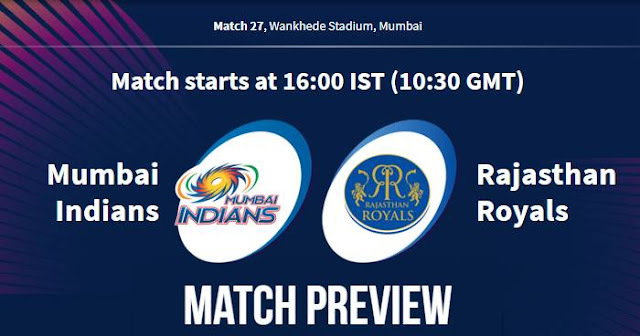 The 27th match of the 12th season of Indian Premier League - IPL 2019 will be played between Mumbai Indians (MI) and Rajasthan Royals (RR) on 13 April 2019 at Wankhede Stadium, Mumbai. As far as weather is concerned, being an afternoon match it will be hot match hours with the temperature above 30°C and humidity above 50%. Wankhede has a batting-friendly pitch. The ball will come on to the bat nicely, should be plenty of runs on this surface, a typical Wankhede pitch. Spinners will be more useful here than the pacers, both teams might play with two full-time spinners. This is an outstanding cricket wicket. The extra bounce is really going to help the batsmen. Mumbai Indians are 3rd on the points table with 8 points in 6 matches; 4 wins and 3 loss. On the other hand, Rajasthan Royals are 7th on the points table with 2 points in 6 matches; 5 loss and 1 win that too against the Royal Challengers Bangalore who is yet to win a match this season. Rohit Sharma is fit and will be playing that means Siddhesh Lad will be sent back to the bench. And also Evin Lewis will be replacing Quinton de Kock. Rajasthan Royal don't have many options mainly in their bowling department and would be playing with the same combination. Mumbai Indians (MI) and Rajasthan Royals (RR) have played overall 18 matches against each other and with one abandoned due to rain in Indian Premier League (IPL). Out of 18 matches in IPL, Mumbai Indians have won 10 matches and Rajasthan Royals have won 8 matches. In IPL 2018, both matches between Rajasthan Royals and Mumbai Indians were won by Rajasthan Royals. At Wankhede Stadium, Mumbai; Mumbai Indians and Rajasthan Royals have played 6 matches against each other. Out of 6 matches, Mumbai Indians have won 4 matches and Rajasthan Royals have won 2 matches. Pace bowlers account for 32 of the 37 wickets taken by bowlers in the three matches played at the Wankhede Stadium this season. The Mumbai Indians have realised only 5 wickets from their spinners in VIVO IPL 2019 – the lowest among all teams this season. The Rajasthan Royals have the poorest economy rate in the middle nine overs and the five death overs; their economy rate in the middle nine overs is 8.89, and their economy rate in the final five overs is 11.50. Probable Playing XI for MI: Rohit Sharma (c), Evin Lewis/Quinton de Kock, Suryakumar Yadav, Ishan Kishan, Kieron Pollard, Krunal Pandya, Hardik Pandya, Rahul Chahar, Alzarri Joseph, Jasprit Bumrah, Jason Behrendoff. Probable Playing XI for RR: Ajinkya Rahane (c), Jos Buttler (wk), Sanju Samson, Steve Smith, Rahul Tripathi, Ben Stokes, Riyan Parag, Jofra Archer, Shreyas Gopal, Jaydev Unadkat, Dhawal Kulkarni.